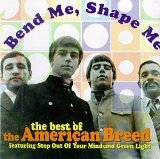 6 "Bend Me, Shape Me"
The American Breed was an American rock band that was formed in 1966 and disbanded in 1969, later evolving into Rufus. The group was formed in Cicero, Illinois as Gary & The Nite Lites. The group's greatest success was the single, "Bend Me, Shape Me," which reached number five on the U.S. Billboard Hot 100 chart in 1968. The song, written by Scott English and Larry Weiss, was a remake of a recording by The Outsiders that had been released the year before. The group also appeared on the 16 December 1967 episode of the television show American Bandstand, along with Pink Floyd.